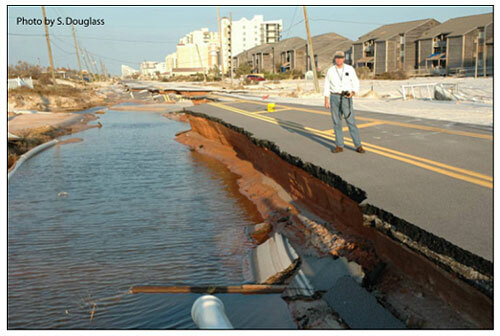 During a Thanksgiving Day 2006 storm a portion of NC 12 was being overwashed due to storm surge and waves. NCDOT personnel attempting to keep the road open are visible to the right of the photo. A small, recently constructed sand dune is shown at the left of the photo. Individual waves are washing across the road in the center of the photo and a new deposit of sand is visible on the barrier island. Post-storm damage from overwashing during Hurricane Ivan (2004) is shown in Figure 8.2. The road pavement elevation was about +8 feet (NAVD) and the storm surge peak from Hurricane Ivan was roughly 11 feet (NAVD). This chapter outlines mechanisms causing damage to pavements due to overwash and suggests strategies to minimize damage. There are several mechanisms that damage pavements subject to overwash. One is direct wave attack on the seaward shoulder of the road. Another is flow across the road and down the landward shoulder. This is a “weir-flow” damage mechanism. A third mechanism is flow parallel to the road as water moves to “breaches” or lower spots in the road as the storm surge recedes. Paradoxically, much of the damage to road pavements observed after Hurricane Ivan (2004) was on the landward side of the road. The Gulf of Mexico is to the right side of Figure 8.2 (behind the buildings). Figure 8.3 shows another example of similar damage. There was partial pavement undermining on the landward side of the road. 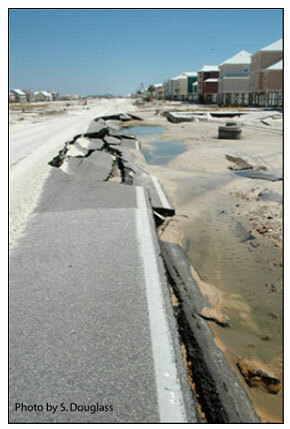 Hurricane Ivan damaged over 50 miles of roads with partial damage as shown or complete damage. It is speculated that weir-flow was the primary cause of the failure mode with contributions from parallel flow. The specifics of the damage mechanism are: the road embankment acts like a broad-crested weir to the incoming storm surge and the pavement is essentially the crest of the broad-crested weir. As the surge elevation exceeds the elevation of the crown of the road, water flows across the road. Flow across a broad-crested weir passes through the critical flow. Flow down the landward shoulder is super-critical. Supercritical flows scour the shoulder material. If the scour reaches the edge of the pavement, water continuing to flow over the edge of the pavement forms a hydraulic jump and undermines the pavement. The same mechanism is scour caused by flow down the seaward shoulder later in the storm as the surge returns to the sea. The same general mechanism is responsible for damage to road embankments in a riverine environment (Chen and Anderson 1987, Clopper and Chen 1988). 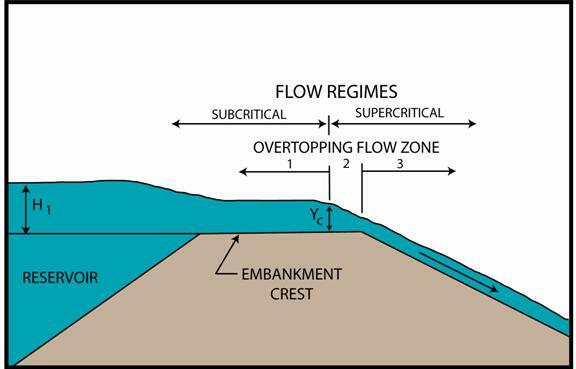 Figure 8.4 shows the general flow regimes that are established when a roadway embankment is overtopped. Damage can occur with or without tailwater (see Figure 8.5). Figure 8.4. Flow regimes leading to failure of embankments in riverine flooding situations (after Clopper and Chen 1988). Figure 8.6 shows a road destroyed during Tropical Storm Arlene (June 2005). This road was under construction after having been destroyed the previous year by Hurricane Ivan (September 2004). Hurricane Ivan removed all the sand dunes and allowed this portion of the barrier island to overwash during smaller storms. Figure 8.6. Pavement destroyed by the weir-flow mechanism (Ft. Pickens Road, Gulf Islands National Seashore, near Pensacola, Florida). During several small storms in 2005, weir-flow was observed. Prior to those storms, the barrier islands were typically evacuated during major storms and the islands had sand dunes that prevented overwash during minor storms. Figure 8.7 and Figure 8.8 show the mechanism at two different locations during Tropical Storm Cindy (July 2005). The storm surge flow direction is from the ocean to a bay in both pictures. Flow is from right to left across the pavement in Figure 8.7 and in the opposite direction in Figure 8.8. There is a small hydraulic jump on the downstream side in each picture due to the elevation drop across the edge of the pavement. Figure 8.7. Weir-flow damage beginning. 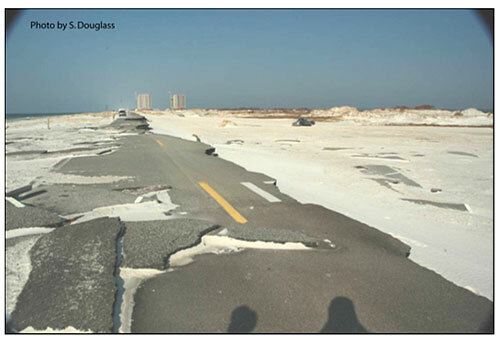 (Florida 399, Fort Pickens Road, Gulf Islands National Seashore; July 2005; FHWA photo). Figure 8.8. Weir-flow damage occurring. (Florida 399, Fort Pickens Road, Gulf Islands National Seashore; July 2005; FHWA photo). The coastal weir-flow damage mechanism has been investigated at prototype-scale in a laboratory in an FHWA-funded study conducted jointly by the University of South Alabama (USA) and Texas A&M University (TAMU). Figure 8.9 shows a schematic of the laboratory set-up and Figure 8.10 and Figure 8.11 show schematics of the results from tests conducted in June 2005 at the Haynes Coastal Engineering Laboratory at TAMU. The experiment was conducted in a 12-foot wide and 10-foot deep flume. A sandy road embankment was constructed in the flume with a roadway on its crest consisting of 12, 2-foot wide concrete slabs. The sand shoulders were unconsolidated typical of many coastal highways. Water was pumped across the road section until failure as shown in Figure 8.10 and Figure 8.11. Figure 8.12 and Figure 8.13 show the failure. The USA/TAMU tests showed that the weir-flow is the likely cause of pavement damage observed in post-storm damage assessments. The damage can occur with only a little depth of water flowing across the road. Figure 8.12. 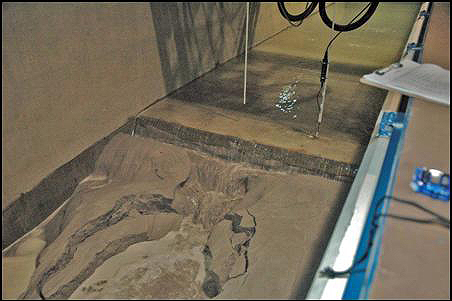 Laboratory tests of the weir-flow damage mechanism showing scour destroying the downstream shoulder and beginning to undermine the edge of pavement. (USA/TAMU flume tests, June 2005). Figure 8.13. 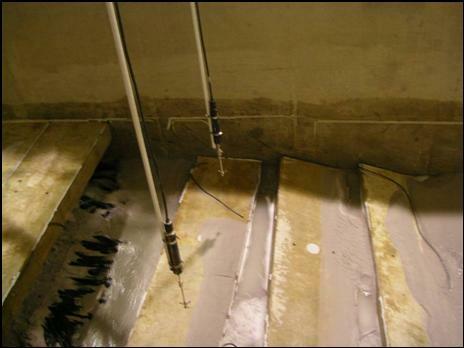 Laboratory tests of the weir-flow damage mechanism showing scour has continued to point of undermining failure of 3 sections (6 feet) of roadway surface. (USA/TAMU flume tests, June 2005). It is likely that waves exacerbate the weir-flow damage mechanism. Waves moving across the pavement on the storm surge will increase the instantaneous flow velocities on the downstream shoulder which lead to more scour. No guidance is available to estimate scour due to this phenomenon at this time. Some levee failures in the greater New Orleans area during Hurricane Katrina were also due to downstream erosion due to overtopping waves. Clopper and Chen (1988) discuss uplift on overtopped pavements on a riverine embankment. 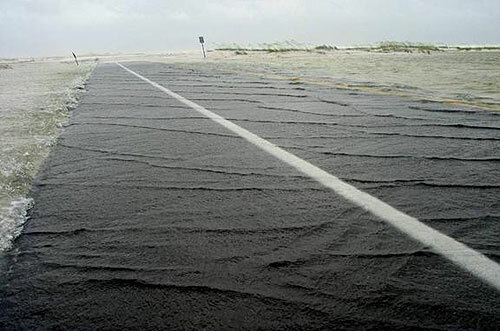 Uplifting may be an even greater problem in the coastal environment because of the easier transmittal of pore-pressure under the pavement due to the sandy nature of the coastal road bases. 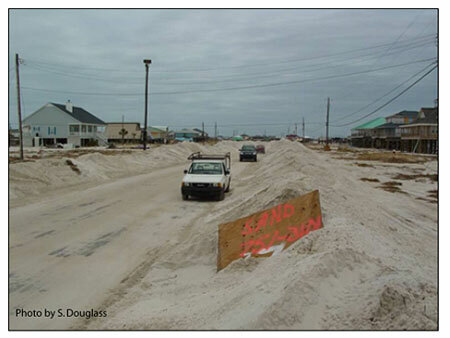 There was some evidence of pavement lifting during Hurricane Ivan as shown in Figure 8.14. The same weir-flow mechanism that can damage the landward shoulder of a coastal road can damage the seaward shoulder too. Later in the storm, as the storm surge recedes, the water elevation on the landward side of the road embankment may be higher than the elevation on the seaward side. Flow is back to the sea and the downstream shoulder is now the seaward shoulder. Figure 8.15 shows pavement damage likely due to return flow. 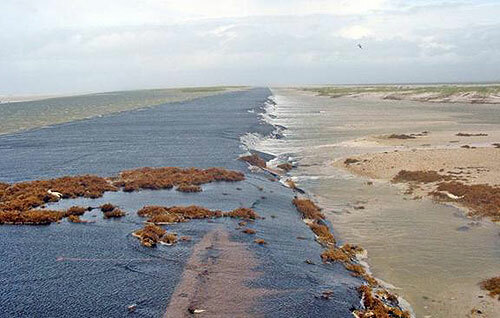 Another related damage mechanism is parallel flow (parallel to the road direction) along the landward side of the coastal highway embankment as the storm surge recedes. Late in the storm, the embankment can begin to act like a dam holding the flood waters on the barrier island. If a portion of the embankment is lower due to failure or breaching, then water will flow laterally toward the low spot in the embankment. This flow scours the foundation material along the shoulder and contributes to its damage or failure. Lateral flow along the shoulders during coastal storms has been observed by Florida DOT personnel at US 98 near Destin, Florida. There is post-storm evidence of this flow in many locations (including the photo shown in Figure 8.2). Figure 8.14. Pavement moved landward by overwash processes. (Gulf Islands National Seashore, Perdido Key, Florida after Hurricane Ivan; 2004). Figure 8.15. Evidence of weir-flow damage to the seaward edge of pavement due to return flow late in the storm (West Beach Blvd., Alabama 182, Hurricane Ivan, Gulf Shores, Alabama). 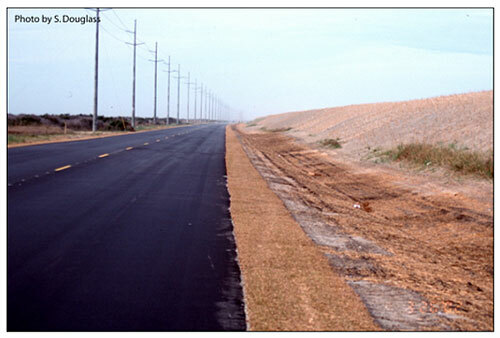 constructing a sand dune seaward of the road to reduce the likelihood of overwashing and to provide a reservoir of sand to bury the pavement when overwashing occurs. armoring of the shoulders of the road to resist erosion during overwashing. Storm overwash on barrier islands often naturally erodes elevation from the front portion of the island and deposits sand on the landward portion of the island. This process is shown schematically in Figure 8.16. Frontal dunes are often the highest elevations on a barrier island. These dunes and the beach berm seaward of them often erode in major storms through dune erosion and overwash processes. Sand is pulled offshore until the dune crest is breached or overtopped by the storm surge. Then sand moves landward and is deposited in lower elevations on the back of the island. These deposits, called overwash fans, can extend back into the bay. Figure 8.16. Schematic of sand erosion and deposition on a barrier island resulting from overwash. If the road way is located where cross-section erodes, it will be subjected to severe wave attack and scour. If, however, it is located in the deposition zone, it can be buried by sand early in the overwashing event. Some roads, found under this layer of sand after a coastal storm, have been undamaged. A bulldozer blade can scrape the sand off the road and the road can be opened to traffic shortly after the storm. Another approach to reducing damage due to the weir-flow is to lower the elevation of the road to at or below adjacent ground elevations. This can prevent the weir flow from occurring since the crest of the pavement is not the highest portion of the grade. 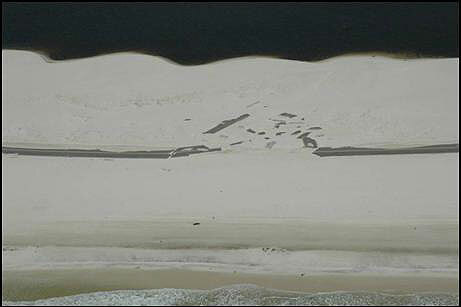 Figure 8.17 shows a road buried by overwash sand that survived a major hurricane. The piles of sand along the road were scraped off the road as part of the post-storm maintenance. There is some practical limit to lowering the road which depends on drainage and safety. Lower roads may also require more maintenance such as sand sweeping. Installation of sand fencing and vegetation can significantly reduce drifting sand and the frequency of sweeping requirements. Experience in west Florida suggests that constructing a typical road embankment elevated above the adjacent ground elevations can result in significant damage even if the road is relocated away from the ocean. Sand dunes can be encouraged or constructed seaward of roads to reduce the likelihood of overwashing and to provide a reservoir of sand to bury the pavement when overwashing occurs. Many states and local government have attempted to construct sand dunes seaward of roads to protect against storm surge and waves. 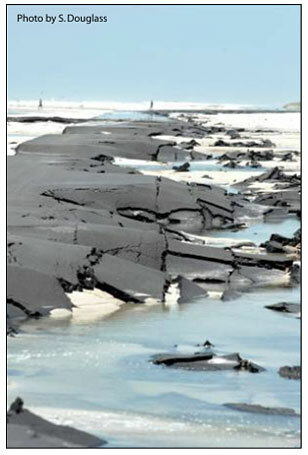 North Carolina has used this approach to protect portions of North Carolina Highway 12 along the Outer Banks. Figure 8.18 shows a portion of that highway north of Buxton, North Carolina, where a large, artificial sand dune has been constructed on the seaward side of the highway. Dune erosion modeling tools can be used to design the size and shape of the dune. Construction of a healthy sand dune usually requires vegetative plantings to stabilize the dune and to establish a dune that functions like a natural dune. All three of the above approaches to reducing damage to pavements during overwashing can be implemented together. The schematic of Figure 8.19 shows a new road located as far from the ocean as practical, built at a low elevation, with small dunes constructed near it. The dune vegetation also acts to reduce wind-blown sand from covering the road during normal (non-storm) conditions. Figure 8.19. Schematic summarizing three approaches (bayward location, low elevation, constructed sand dunes near road) to minimize damage to roads that overwash. The downstream shoulder of roads that experience overwashing damage can be armored to withstand high velocity flows. This approach has been adopted to protect a section of US Highway 98 along the Florida coast west of Destin. 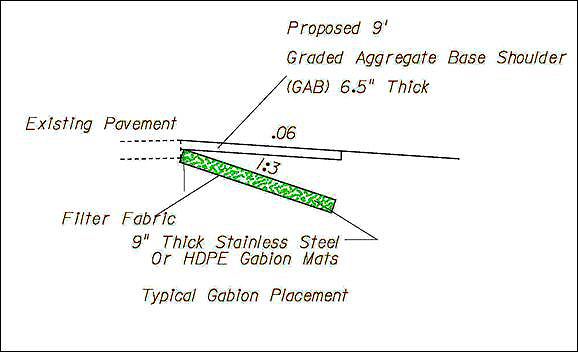 The armoring includes sheet piling (Figure 8.20) and gabions (Figure 8.21). The sheet piling is located on the shoulder of the pavement farthest from the sea. This is the edge of pavement that has suffered the most damage due to the overwash mechanism in past hurricanes. Buried gabions are used where the overwashing flow may be lower but parallel to the road during the storm is expected to be strong enough to cause damage. This design was constructed in 2005, after Hurricane Ivan, and had not been tested by a major overwashing event at the time this document was written. Figure 8.20. Sheet pile, with buried gabions for scour protection, at edge of pavement to resist pavement damage due to coastal storm surge overwash. (Florida DOT figure). Clopper and Chen (1988) provide guidance for armoring shoulders that might be applicable to the coastal problem. They conducted laboratory experiments on different possible countermeasures to resist the flow of water across a highway embankment. Their tests were based on riverine overflow situations and focused on soil types not as sandy as those typically found at the coast. They only considered current flow forces and not wave forces. However, Clopper and Chen (1988) found that a concrete block revetment system with relatively heavy blocks, horizontal and vertical interlocking cables, and anchors was able to resist the hydraulic forces due to overtopping better than a number of other alternatives. They tested flow rates generated by up to 4 feet of differential head over the embankment. Figure 8.22 is a sketch of how that concept could be implemented as a retrofit to protect a coastal highway. The capabilities of interlocking blocks to withstand the overtopping condition was confirmed by laboratory tests by Clopper (1989).